My great-great grandmother’s parents, Henry Lewis Hoover and Lula Cox, are still a brick wall. I managed to find death notices for both, though. Both of them have memorials on Findagrave, but there are apparently no stones. I wonder if they just never had grave markers? Or were they lost or destroyed? Hollywood Cemetery is apparently abandoned, so there is no formal upkeep, just volunteers. I haven’t been successful searching old papers for Henry. He seems to have kept his nose clean. But there’s still a weird mystery here, again maybe having to do with the Civil War. Like James R. Thompson, Henry surely fought in the war. He wasn’t too old or young. I found him in the 1870 census, already married to Lula and with their first son. His occupation was physician. Then things sort of went to hell for him. Piecing together the timeline, using censuses and city directories, he was: chiropodist (1876-1878), dairyman (1879-1880), peddler (1889-1890), stove repair man (1892-1900). I know physicians weren’t as extensively trained back then, and there was very little (or no!) oversight. I wonder if he was just kind of thrown into the job, during the war, then after the war he couldn’t manage it? Or if he was truly skilled and the war was so devastating to him that he never got his act together afterward? That’s assuming he actually fought in the war, of course. “[Death Notice],” The Atlanta Constitution, 15 Apr 1904, p. 4, col. 1; digital images, Newspapers.com (www.newspapers.com : accessed 26 Jun 2017). Rec. Date: 14 May 2017. 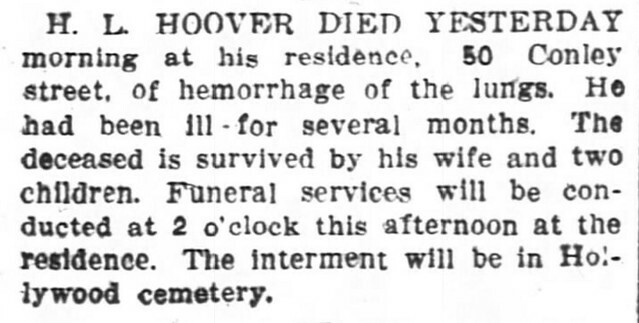 H. L. HOOVER DIED YESTERDAY morning at his residence, 50 Conley street, of hemorrhage of the lungs. He had been ill for several months. The deceased is survived by his wife and two children. Funeral services will be conducted at 2 o’clock this afternoon at the residence. The internment will be in Hollywood cemetery. “Mortuary,” The Atlanta Constitution, 6 Jun 1909, p. 2C, col. 7; digital images, Newspapers.com (www.newspapers.com : accessed 26 Jun 2017). Rec. Date: 14 May 2017. 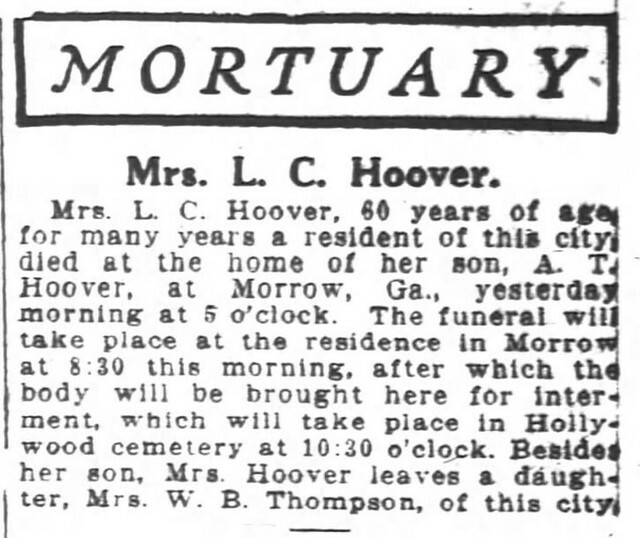 Mrs. L. C. Hoover, 60 years of age, for many years a resident of this city, died at the home of her son, A. T. Hoover, at Morrow, Ga., yesterday morning at 5 o’clock. The funeral will take place at the residence in Morrow at 8:30 this morning, after which the body will be brought here for internment, which will take place in Hollywood cemetery at 10:30 o’clock. Besides her son, Mrs. Hoover leaves a daughter, Mrs. W. B. Thompson, of this city.